Ecommerce is going through a phase of the revolution. It is a departure from the basics of B2C which still focuses on discounts and low pricing for customer satisfaction. On the other hand, a B2B ecommerce website works on the premise of technology, faster order cycle, personalized pricing, location-based content, bigger ticket sizes and latest technology. The boom in the B2B market is driven by the experience of customers in the B2C arena and they are now expecting B2B to offer even greater benefits by going online. Forrester Research has forecasted that global B2B market is expected to go beyond $6.5 trillion in the coming years. By choosing the online route for B2B you can not only claim your share in this huge growth but will also have the early starter’s edge over your competitors. Brick and mortar business is restricting in nature and needs huge efforts to unlock new sales channels and explore new territories. On the other hand, online B2B unlocks a huge potential by adding new sales channels to your business. You can grow and scale your business to new markets by using advanced ecommerce features like a multi-store or multi-seller website in multiple languages. Reaching out to new market segments and catering to diverse audience groups becomes easier and efficient with the help of technology and tools for automation. Using the elements of enterprise ecommerce solution offers great efficiencies in Business to business online commerce. Using features like bulk order processing, granular user roles, audit log, customized invoice, etc, reduce manual effort and human error and bring around efficiencies in the business. Other features like white labelling help in building a strong brand value for your business beyond geographical boundaries. Taking B2B online helps in closing deals faster and also helps in creating bigger ticket sizes. Your business is open round the clock for customers across the globe and by offering country-specific payment and shipping options you can ensure that each order is closed faster. By using a comprehensive B2B ecommerce platform you can increase your sales volume by displaying related and relevant products to prospective buyers. By using cross-selling and upselling you can not only get more orders but also bigger average order sizes. Also, a platform that offers features like fixing minimum order quantity, pricing override for targeted customer group, pricing comparison, inquiry generation form to gather customer specific enquires can help you boost your sales volume and ticket sizes. B2B has the advantage of having many proven marketing and customer acquisition skills passed on by its B2C counterparts. As a wholesale business owner you might have faced scenarios where your clients turn to other vendors due to a delay from your end in closing the deal. Opting for B2B ecommerce website can make your processes automated and faster and thus help you in customer retention. Online B2B not only helps you in retaining your customers but also allows to acquire new customers. Research suggests that 9 out of 10 B2B buyers research for products online before closing the final deal. When you showcase your products in an attractive manner, use optimized content, offer wholesale and retail pricing, give the option to compare prices, your likelihood of acquiring new customers grows manifold. You can also take your business to global markets with multilingual, multi-seller and multi-store sites. Also, since many manufacturers and suppliers have not yet woken up to this huge trend, you have the benefit of an early start and can use it to create a loyal customer base with good customer support and value-added services. 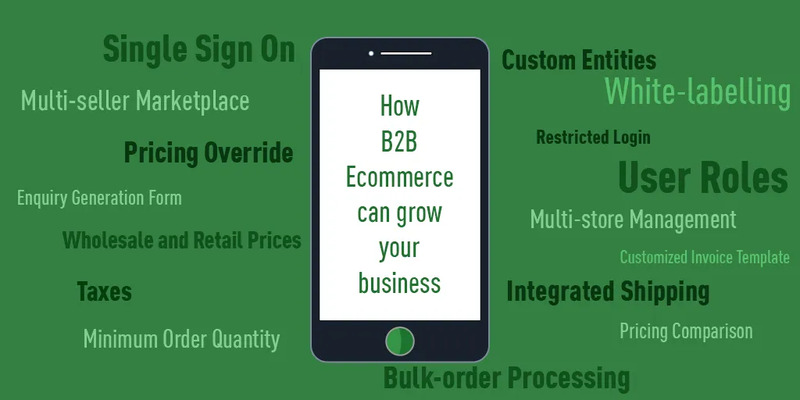 Now that you know the obvious advantages of taking your B2B business online it becomes imperative that you go for one of the best B2B eCommerce solutions providers. StoreHippo ecommerce platform offers all the features needed to explore the full potential of your business and grow it to domestic as well as international markets. Keep watching this space as we will bring more articles on B2B ecommerce. If you have any queries on the topic, leave us a comment below.